EH, IS LIAM Payne ok? Ok, not sure what prompted that. The post has not gone down well with the online community, with most resorting to taking the mick out of him. Not to mention the fact that his tweet was technically incorrect anyway. The most offensive thing is that he doesn't realise most commercial planes are indeed jets since they are propelled by jet engines. So...nerghhhh. He got a new nickname out of it though, if nothing else. Yep, we get it Liam. You are A Legend. We’re happy for you. A gentle reminder that he is a father. Of a child. Email “Liam Payne put up an insanely cringey photo on Instagram and people are roasting him for it”. 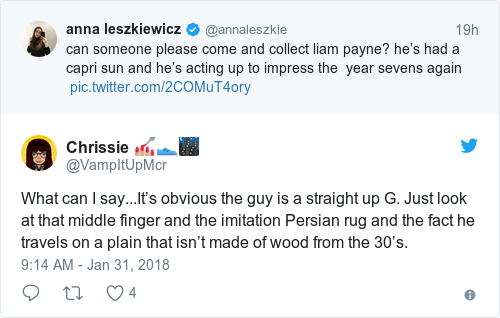 Feedback on “Liam Payne put up an insanely cringey photo on Instagram and people are roasting him for it”.